For those that have known me for a while may remember that 2 years ago with the release of Koa'ki Meiru Wall I was a Rock Stunner. It means that you can negate with abandon and keep bringing them back. Theres also more reasons too that this architype is coming into its own but Ill get into that in a second. Im not gonna bore you with a long discussion here about the Koa'ki Meirus, just go read the card and view the rulings to familiarize yourselves. 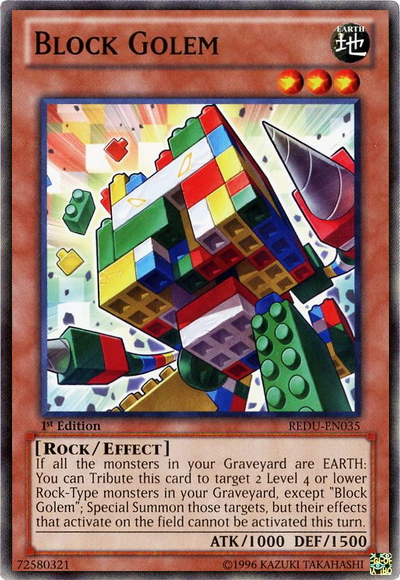 Rock Golem- This card is the keystone to the new play style If you can get him out and you have the cards in the grave you can either set up for locking the field down or XYZ into grade 4s right away. Also in the side is Fossil Dyna and his effect is not hampered by Block Golems negation effect. So right away he pluses, then if need be you can bring him back via COTH, Reborn, or Release to plus more. The biggest problem you will have will be getting the grave filled with the monsters you need to abuse his effect. The solution are 4 cards. Trooper, Catapult Zone, Jar and even Dark Hole. Revival Golem- Car is a pain when used right for your opponent. He is so under rated in his simplest form you set him and he sits there at 2100 defense and with his effect you can bring him to hand to have a reveal for your KM monsters but mostly will be sending him to the grave via Trooper, or Catapult and he will be ss for xyz summons. Using one of his effects is mandatory so if you have a grandsoil in your hand and 4 earths in the grave, sadly you gotta ss him or bring him to hand. So many rock stun players hate Catapult Zone, and in a big inzektor format I may too. But in all my testing so far the card works wonders. In a lot of instances I have good control of the board with my KMs the most common way out for opponents is to attack over the one that is giving them the most issues. Thats where ppl run solidarity or other such cards that can pump up the monsters or they prematurely XYZ into something bigger giving up control and losing some field presence, or they run cards like D Prison or Mirror force to counter this (a great option and may be the route you decide to go in) For me though I love how it can help me control the grave or get me a free Revival G.
Draw power is an issue. Sure we got the Pots in there and Jar and maybe a trooper via effect. But This is where Trade in comes into play. We have 7 targets (6 if you feel 3 gaias are too much) it really does wonders for those cards that can die in your hand or if you need one more earth in the grave for grand soil or Gaia, or for CatH or Reborn.